When I first looked at Taoyuan, I wasn't interested. In fact, I was almost put off by it. The only reason why I decided to try the game was because A. It's my job to do so, and B. because the idol promoting the game caught my eye. Originally put off by the idea of another Chinese Three Kingdoms era MMO, I was instantly charmed by the art style of Taoyuan. The colorful cartoony MMO world was warm and inviting, the character art was fun and cute. There is something to be said about cute. Moreover, the art reminded me of Disney's classic movie Mulan. Setting up on Taoyuan was surprisingly fast, there weren't too many convoluted menus to navigate. For the most part even someone who was illiterate in Chinese could get into the game. After setting up my character Taoyuan like nearly every Chinese MMO begins to disappoint. Once the loading screen goes away, you are immediately thrown into a series of mundane quests, quests that serve as tutorials but require the player to do absolutely nothing except talk to NPCS. For the first 15 minutes, there was no action. Luckily Taoyuan has one absolutely redeeming factor, auto search and run. In my opinion the best feature of Taoyuan has to be auto search and run. Imagine being able to run from NPC to NPC without searching, well in Taoyuan if you click the name of an NPC in a text box your character automatically runs to said NPC. This feature saved me so much time and trouble, particularly during the first 15 minutes of NPC hunting. Once the NPC hunting is over, my character grew miraculously to level 5 and was given a sword, a bow, and a wand. The weapons and weapon usage denotes the level and class of the player. I chose the sword. The battle system of the game took me by surprise. At first I was expecting over world enemies to kill but instead I was treated to a random battle turn based system. On top of the odd turn based system there was even the element of Pokemon, half way through the battle and even to end some battles, you have the opportunity to capture the enemy. What do you do with the captured enemy? Beats me, the game doesn't explain it. 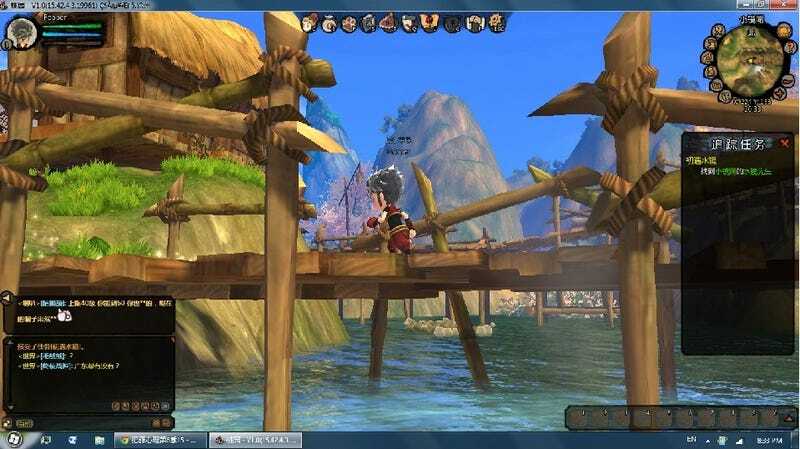 Despite the throwback to old turn-based RPG's, I wasn't very impressed by Taoyuan. After playing it for about 6 hours, I got bored. The turn-based RPG battle system while interesting and nostalgic drew the game on for too long. Think of Final Fantasy XI but "disney-fied" with a little Three Kingdoms thrown in, and Taoyuan is what you get.